Theatre and Dance students teach preforming arts classes for children as part of the educational programs offer by the Knott's Family Institute. All classes focus on the basic vocabulary, technique and body movements of specific theatre and dance genres. Students gain hands-on experience in the creative process in the performing arts. For the last four years we have been offering improvisation and scriptwriting classes as part of the Inland Agency's Helping Adolescents Build Life Options (HABLO) Program. This unique partnership is designed to develop Peer Leaders, students who want to have a positive impact on their community. A select number of High School students are chosen to become Peer Leaders each year. As part of their training, they develop and present materials about healthy life choices at youth centers and after school programs throughout the City of San Bernardino. 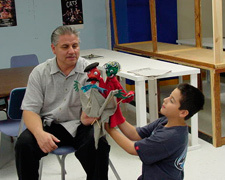 CSUSB Theatre Arts has a rich history of collaborative puppetry projects with community organizations. 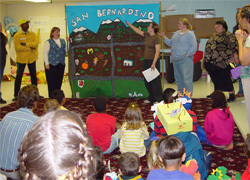 We've created programs and shows with the Water Resources Institute (Lytle is Vital program), Trash for Teaching, Girl Scouts of America, Loma Linda Hospital, and many more. Contact Associate Professor Johanna Smith (909 537 5881) if you're interested in partnering with us. The Coyote Conservatory provides workshops and after-school classes for children, adults, and families! Activities are offered in a wide variety of arts, including: creative drama, dance, puppetry, acting, singing, improvisation, creative writing, crafts, musical theatre, and international dance. Coyote Conservatory curriculum follows the guidelines established in the California Standards for Performing Arts. Children are encouraged to achieve in the following five measurable broad areas: Artistic Perception, Creative Perception, Historical and Cultural Context, Analyzing and Critiquing Art Experiences, and Connecting and applying what is Learned through the Study of Art to Other Subject Areas and to Careers. The program is continually reviewed for quality and effectiveness of instruction using these grade-level specific standards to determine the ongoing impact and success of all Coyote Conservatory activities. Located on E Street (SB's "main drag") the Sturges Center sits at the northern edge of the City's re-development target area. The land is owned by the SBUSD, the building by the City while operations are the responsibility of the non-for-profit Sturges Foundation. Following a period of declining use and deterioration of the building, the Foundation Board was reorganized and is now governed by a partnership of the City of San Bernardino, San Bernardino City Unified School District and California State University, San Bernardino. The Foundation is dedicated to the potential of The Sturges Center as a catalyst for cultural engagement and as an economic engine for the community. Sturges Renovation Project has two primary goals: 1) improve the renovated and improve the venue to better serve community users and attract professional presenters as well as creating a more comfortable experience for the patrons; and 2) contribute to downtown redevelopment efforts by nurturing a more vibrant, diverse cultural life for local residents and increasing foot traffic in the city core.